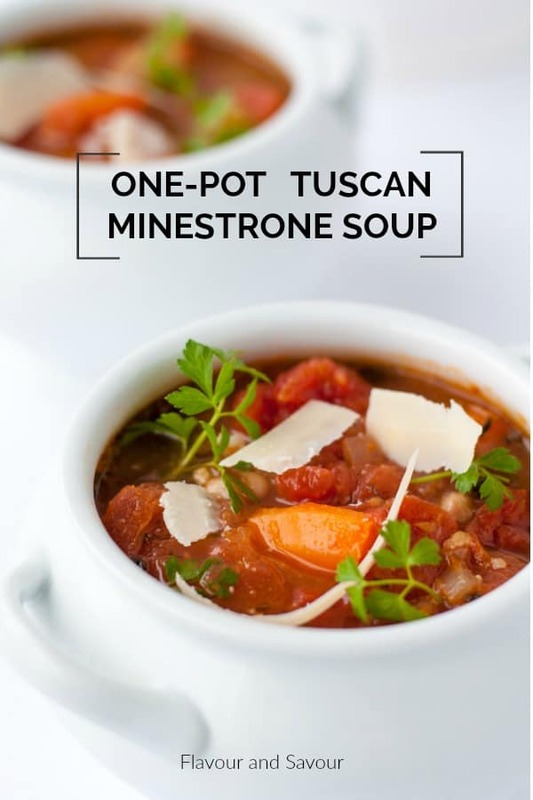 This one-pot healthy and hearty Tuscan Minestrone soup is brimming with rich Italian tomato flavour. It’s an easy slow-cooker soup. Set it and forget it! It’s a simple, rustic meatless meal that totally satisfies. 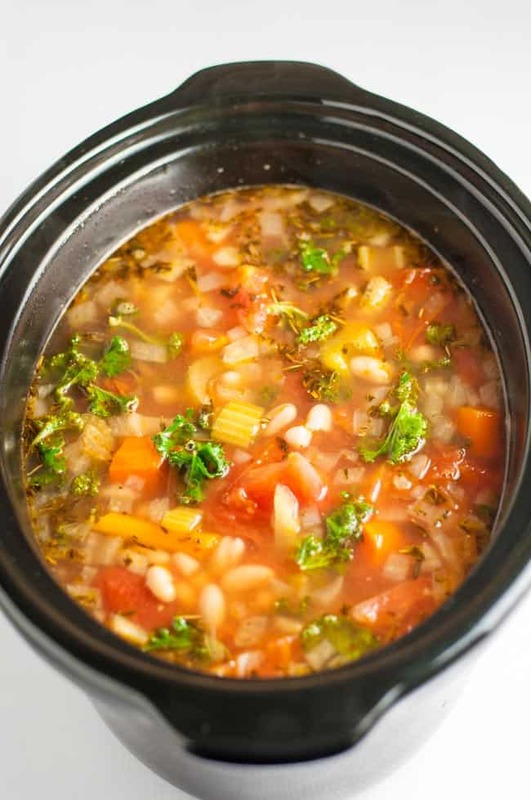 I had Tuscan Minestrone soup simmering in my slow-cooker all afternoon, filling my kitchen with the aromas of oregano, basil and thyme. It took only fifteen minutes to prepare, but its robust flavour made it seem like it should have been far more complex to make. I chopped some veggies, added herbs, broth and tomatoes, and let my slow cooker work its magic. Mangia! Eat. Italian flavours are my favourites. Isn’t that one of the main reasons to visit Italy? History, art, architecture, landscapes, climate, wine, the people . . . these are all other impressive attractions, but food tops the list for me! I’ve been saving sites for possible food adventures to Pocket for our upcoming trip. Cheese from Parma, balsamic vinegar from Modena, lemons from Amalfi and wine from every region . . . I’m busy making my own food map of the country. But today, I’m thinking about Tuscany and remembering the rich and robust flavours of that region. Bruschetta has never tasted so good as it did in the main piazza in Montepulciano last time we visited Italy. 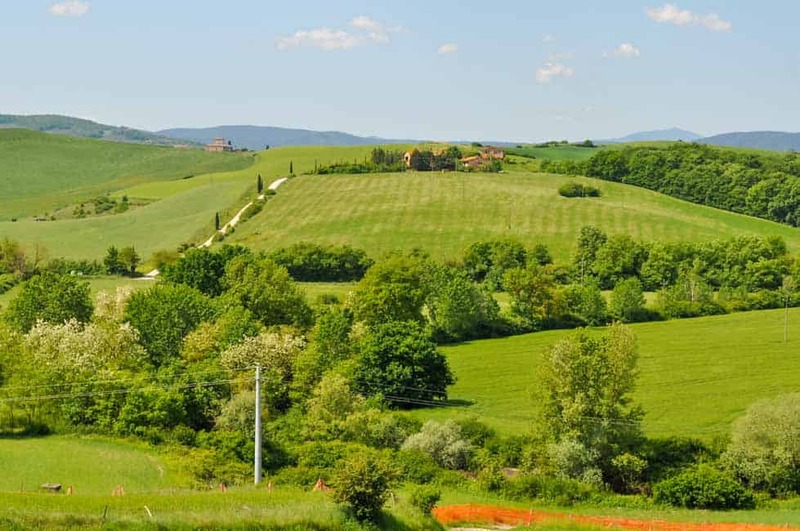 We have booked several nights in two Tuscan agritourismos, which are working farms offering accommodation and sometimes meals as well. The food is usually deliciously rustic: simple meals cooked with the passion for which Italians are so famous. 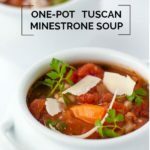 This one-pot Tuscan Minestrone soup is just that: a simple, rustic meatless meal that totally satisfies. It offers lots of interest from herbs and a little kick from the chili flakes. Toss in some fresh kale or spinach, a couple of Parmesan rinds for added creaminess, and some cannellini beans (or white kidney beans) about an hour before serving. Top the bowls with a few shavings of Parmigiano Reggiano, and serve your soup with these Parmesan Crisps or crusty bread to mop up the tasty broth. Combine the first 12 ingredients in a slow cooker. Cover and cook on high for 6 hours. One hour before serving, add the cannellini beans, kale or spinach and Parmesan rinds. Continue cooking covered. Remove the rinds. Ladle into bowls and serve garnished with freshly grated Parmesan cheese. Delizioso! And it’s even better on the second day. Dessert? Don’t mind if I do! Let’s keep it Italian. Citrus Fruit Cup with Gelato and Amaretti or Blueberry Limoncello Crisp. 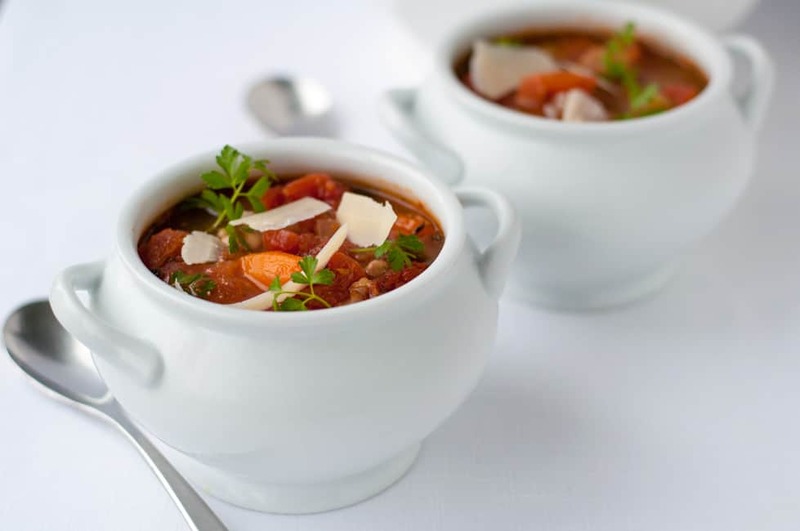 A set-it-and-forget-it hearty Italian Minestrone soup made in your slow cooker. Rich robust flavours from Italian herbs, tomatoes, fennel and cannellini beans. Combine the first 12 ingredients in a slow cooker. Cover and cook on high for 4 hours or on low for 6 hours. One hour before serving, add the cannellini beans, kale or spinach and Parmesan rinds. Continue cooking, covered. Remove rinds, ladle into bowls and serve garnished with freshly grated Parmigiano Reggiano cheese. This recipe makes 8 servings so you would need a 4 or 5-quart slow-cooker. Nutrition information does not include optional Parmesan cheese. This recipe was inspired by one I found in BC Hydro’s Team Power Smart Magazine, Spring 2016, by Jennifer Stamper. The author reminds us that recipes that simmer require less energy than those cooked on the stovetop. A win-win. Beautiful! Love all the amazing ingredients in here and your photos are fabulous. This is a must try. Thanks Sally! This will be one of those meals I make again and again. Easy, nutritious, and tasty! Thanks Patricia! Heading over to check out your blog. 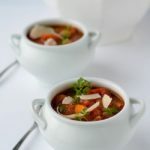 I love minestrone soup so it’s always great to see different recipes. I have never put fennel in mine but it sounds delicious. I’ll have to give it a try on my next storm sup day. I’m a minestrone fan too. The fennel was great and not overpowering at all. Thanks for commenting! Awesome dish! Looks wonderfully simple, but full of flavour. I especially like that you used the cheese rinds to add flavour to the soup. I wish more people would do that! It really adds punch and richness. It sure does. Of course, if you can’t have cow’s milk products, you could always add a different kind of cheese. I really like Pecorino and Manchego, both sheep cheeses. But there is something about Parmesan that just can’t be beat! Tried it and we all loved it. I am so going to make this soup very soon, Elaine. We already love your Texas Black Bean Soup so much in this family – I just know that we will love your One-Pot Healthy Tuscan Minestrone Soup, too! I also save my Parmesan rinds for soups and spaghetti sauce. It is a great thing to do. 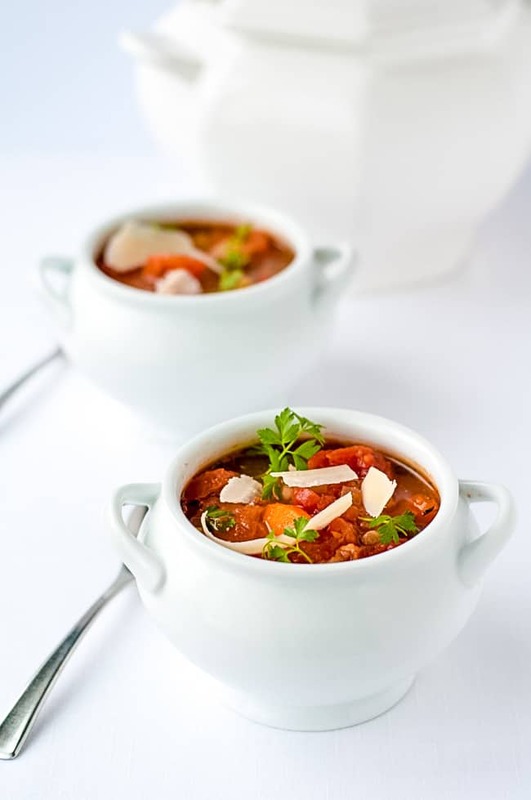 Many thanks for sharing another wonderful slow cooker soup. Thanks so much, Denise! It’s a great meal for those days when I want to get something else done. The soup can be simmering away in the background while I’m busy and presto! Dinner is ready when we are! Thanks for commenting!